A new book launching in Cambridge today explores the parliamentary convention intended to allow MPs a vote on military action. The authors say that the intervention in Syria provides just the latest of several ‘exceptions’ – chipping away further at a convention that may no longer meaningfully exist. The recent intervention in Syria may add airstrikes to the expanding list of exceptions to the convention established to provide democratic oversight of UK military action through a parliamentary vote, say experts in international and constitutional law. During research for a new book, launched today, the legal academics found that, in addition to broadly-defined ‘emergency’ or ‘secrecy’ exceptions, two specific types of military activity – the deployment of embedded Special Forces and unmanned drone strikes – had already been exempted from the convention. Now, by unilaterally authorising the recent intervention in Syria, and justifying the action using language that further narrows the convention’s purview, the current government may have created a further exception for airstrikes – a cornerstone of modern warfare. Drs Veronika Fikfak and Hayley J. Hooper, who conducted the research for their book at Cambridge’s Faculty of Law, say that “if the War Powers Convention continues to exist, we question whether it exists in any meaningful sense”. They argue that increasing exemptions from the convention, combined with a flourishing “information asymmetry” between government and parliament, creates a real risk of another ‘Iraq moment’ in the near future. 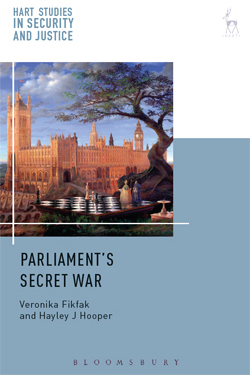 The book Parliament’s Secret War traces the last century of Westminster decision-making during the build up to hostilities, with a focus on the legal debates following the establishment of the War Power Convention in the wake of the Iraq war. Published by Bloomsbury, the book will be launched at Homerton College, Cambridge, this evening (30 April) with a Q and A session with both authors as part of the College’s 250 anniversary series of events. “The idea that the War Powers Convention gives parliament political control over whether the UK goes to war has now been hollowed out to the point where any claim that elected MPs have a say on military action is essentially a deception of British civil society,” says Fikfak, a Fellow of Homerton College. The convention has its origins in the House of Commons vote sanctioning the Iraq invasion in 2003, although some argue this was a fait accompli given the thousands of troops already in the region. Nevertheless, a convention requiring parliamentary support for armed conflict was solidified through a series of votes in the years following Iraq – most significantly with 2013’s decisive vote on Syria, when the government was defeated. Heralded by the media as a milestone in British democracy, the convention sees a “yes or no vote” put to MPs, rather than the government of the day invoking Royal Prerogative: the traditional legal right to declare war in the name of the Crown. Plans to enshrine the convention in law were shelved in 2016, although Labour leader Jeremy Corbyn has renewed discussions of a possible War Power Act since the recent Syria airstrikes. The convention has, however, been a fixture of the Cabinet Manual – an official guide to the UK’s uncodified constitution – since 2011, with successive Defence Ministers recommitting to it both in principle and, to some extent, in practice. Yet the recent circumvention of this potential check on power is arguably only the latest, as the convention has already been subject to “a myriad of exceptions” controlled by government – explored in depth by the new book. For example, in 2015 a British member of Da’esh was killed by drones in Syria, despite parliament making it clear on two previous occasions that it did not support use of force in Syrian territory. Justified by the then government as a ‘new departure’, and couched in language of ‘immediacy’ and ‘direct threat’, this was interpreted “generously” by the Joint Committee on Human Rights as an ‘emergency’ that didn’t breach convention – a precedent for the exception of drone warfare. Also in 2015, British military took part in ground raids on Syrian territory with US forces. The government response was to state that the convention apparently “does not apply [to those] embedded in the armed forces of other nations”, despite the non-emergency situation. The researchers argue that undermining of the convention is compounded by “selective disclosure” of vital information to parliament, often under the guise of state secrecy. This was the current government’s primary justification for disregarding the convention with the recent Syrian strikes. The researchers argue that the nature of war has changed, now limited for the most part to drone and air strikes. “To exclude the majority of military interventions from parliamentary scrutiny risks undermining the accountability of government,” says Hooper.